Even before “brain training” became the new wellness buzzword, neuro-scientists have known that the brain, just like a muscle, benefits from exercise. “Use it or lose it” is the battle cry of the new cognitively fit. Maybe that’s simplifying the case a little, but it does stand to reason that the brain, capable of forming new synaptic connections in response to novel stimulus, could use a little workout to keep its top performance. Research backs up this view. Clinical studies have demonstrated time and again that people with professions or hobbies that provide constant mental stimulation hold off on age-related cognitive decline for far longer than their less-stimulated peers. One interesting study at the University of Oxford in 2009 found that a group taught to juggle over a month showed increased brain activity in MRI scans as opposed to a control group who didn’t learn a new skill. In other words, your brain’s not even that picky! Given any novel stimulus, challenging your brain to solve new problems makes its overall performance improve even at unrelated tasks. Especially creativity skills tend to go way up when you make a habit of solving brain-teasers, because you’re challenging your brain to look at things from a different perspective. OK, that’s it for the health benefits speech. Beyond that, puzzles are just fun. 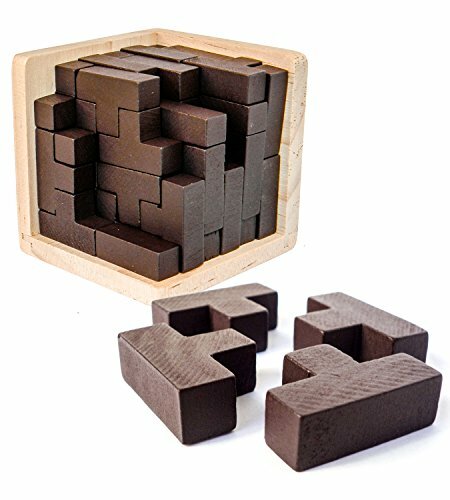 These 3D puzzles are the perfect thing to keep around your desk, office, or rec room to fidget with. Even after you solve them, they make great conversation pieces for entertaining guests. Keep a few in your living room and when somebody with kids come over, they’ll head right for the puzzles and happily amuse themselves. In choosing these, we steered away from the common varieties of puzzles you’ll find at your local store. We’re looking for puzzles that are both elegant to display, and fun to solve, with a degree of challenge to ensure they’re not too easy, but also not frustratingly impossible. If you get stuck, take your time. The point with physical puzzles like these is to keep them around and ponder them during idle moments. No cheating by looking up solutions online now, we’re making you promise! If you only get one wooden puzzle set, be sure to get this one! This is a box of interlocking “Tetris” style pieces, with several challenging configurations to solve – including packing them back in the box they came in! But even without solving puzzles, the pieces are also ideal for plain old building-block fun. A lot of bang for your buck with this large set. 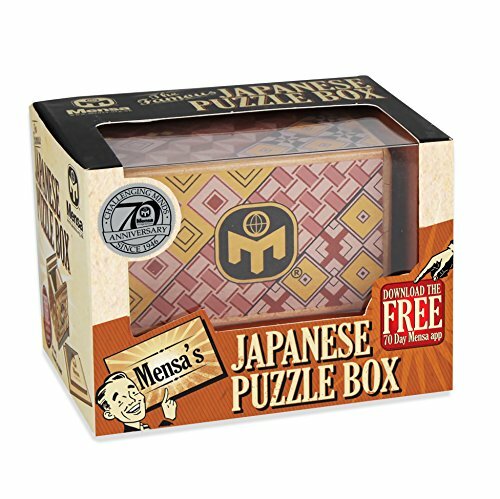 Japanese puzzles boxes have amazed and intrigued People for Generations. It takes patience to open these puzzle boxes. Can you unlock the secret? Mensa started out as the organization for high-IQ members, but these days they’re basically a marketing label for brain teasers. However, they do know a good puzzle! This is one of those sliding-panel numbers where the trick is to get it open. It’s beautifully decorated, making a classy decorative piece for your living room. As a bonus, it works as a partially secure storage compartment. SECURE - The corners of all the cubes are rounded and that makes for very smooth operation. There is successful if you can take the lock apart or assemble it, and you can look at the photo to see if you got it . TEASE YOUR BRAIN AND BENEIFTS YOUR PRECIOUS ONE - Get more focused and accurate than ever and stave off dementia! This 3D cube acts as a fun, brain sharpening tool, which will keep your mental abilities in tip top shape, it's actually different to solve than the traditional Cube. The ultimate game you want to get your hands on. THE PERFECT GIFT IDEA - Fidget toy cube makes the perfect gift for anyone - for every occasion! Perfect for kids and adults of all ages for Christmas gifts, office gifts, etc. 3D brain teaser they can take anywhere - even on the airplane! Add one or several Speed Cubes to your cart now! 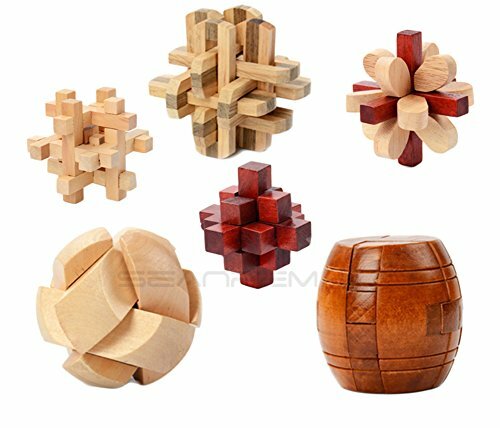 There’s several wooden puzzle sets out there, but this one stands above the rest in having a variety of different designs and approaches, and for not including the default six-point “burr” that seems to be in every collection of this type. 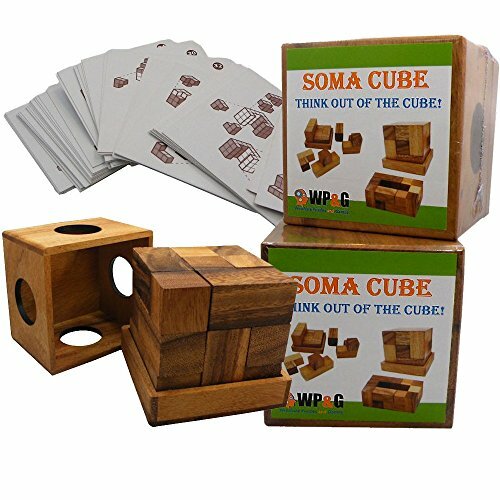 Get this to have an instant puzzle collection for those busy hands around your home and office. Complete the labyrinth by pulling the wand out of the bottom! We like this one for being a unique take on puzzles we haven;t seen a lot of. 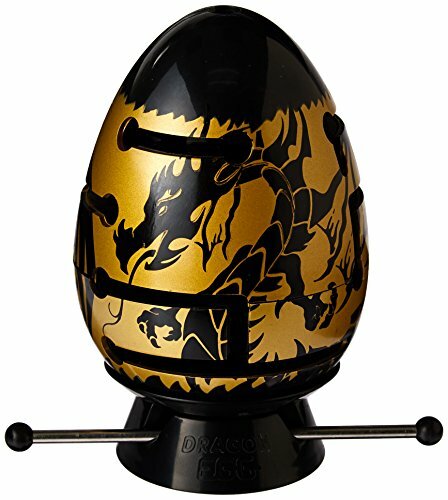 It’s a variation on the classic hidden maze variety, with a bar set through the puzzle which you have to navigate through the egg. The ornate dragon design on it makes it a decorative piece for the knick-knack shelf. ✂️ THE PERFECT HOBBY: Whether these are your first 3D puzzles or you are looking to expand your already existing craft collection, you've come to the right place. These wooden dino puzzles will keep you busy as you put the dinosaur bones together to make a skeleton. Kids and adults alike will enjoy building dinosaurs with our 3D wood puzzle. 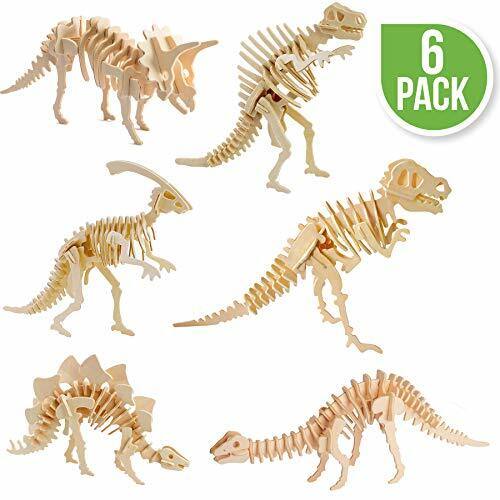 秊 WOODEN DINO KIT: This DIY dinosaur puzzle kit will help you create a mini yet colossal Tyrannosaurus Rex, a Stegosaurus, a Parasaurolophus, a Brontosaurus, a Spinosaurus, and a Triceratops. We also make a locomotive puzzle. Great for men, women, boys, and girls, these cooperative, quiet activities are perfect for the entire family.  EDUCATIONAL MATERIALS: If you or your child is interested in archeology, fossils, and artifacts, you'll love these small wooden dinosaur puzzles that help promote reasoning, logic, imagination, and other key factors that affect the mind. Children will love these hands-on, imaginative introductions to the world of dinosaurs.  QUALITY PLYWOOD: Our punch-out sheets are high-quality and fun to use. The fact that our supplies are made of non-toxic plywood that is safe for the environment is an added bonus. Because this puzzle is often used by children, we made sure that the edges of each item have a smooth finish and no jagged edges.  A GREAT GIFT: Finding a good gift can be hard, especially if you're looking for one that can also help boost a child's education. Our dinosaur 3D wood puzzles are great for boys and girls who like to engage in STEM learning with the best interactive materials available. Give for a birthday, Christmas, or another occasion. So who said puzzles have to be abstract? These 3D dinosaur models are both challenging puzzles and satisfying model-building, with a handsome display piece when you’re done. This is a lot of dinosaur for the buck, and it will be a favorite for kids as well. These kinds of puzzles are a classic that have been around for years, but due for a revival. DELUXE VERSION with 50 playing cards - Enjoy hours of fun developing thinking skills. Each card have a building shape challenge on one side, and the solution on the other side of the card. LARGE VERSION: The size of the assembled cube will be 3.5" x 3.5" x 3.5"